When I was growing up, there was one thing that pulled me out of my yearly end-of-summer drama queen whine fests: back to school shopping. There was just something about walking into a store and seeing all those racks filled with new collections - especially dresses. 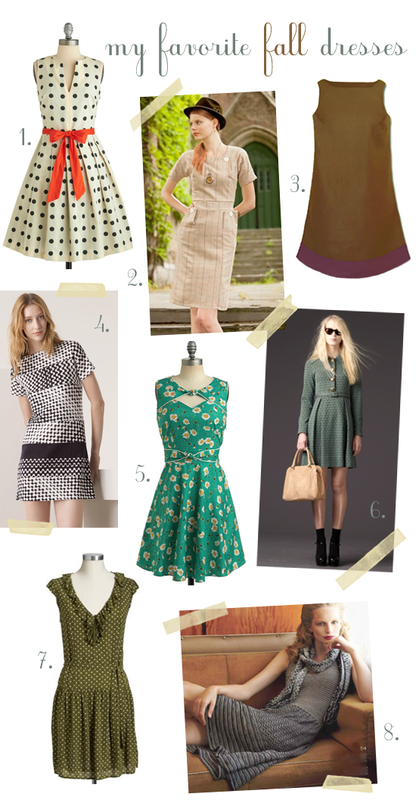 My school girl days may be long gone, but the adoration for fall-time dresses never left. And for 2011, I've come up with a list of my 8 very favorites. As you can see, there's quite the mix of styles and colors. The more traditional fall tones and fabrics are always appealing to me, but I'm also loving brighter + bolder colors and prints for this season. 1. The Dice as Nice Dress from ModCloth , $247.99. 2. The Professorial Dress from Shabby Apple , $86. 3. The Edie Organic Mod Mini Dress from Mountains of the Moon, $76. 4. Missoni for Target Dress; price available upon September 13th release. 5. The Good Ol' Daisy Dress from ModCloth , $84.99. 6. The Birdie Wool Jaquard Shirt Dress from Orla Kiely, $485. 7. Polkadot Shirt Dress from Old Navy, $34.94. 8. Test Pattern Sweaterdress from Anthropologie, $148. Do you get excited for fall dresses? Which of these 8 is your favorite? I'm so excited for fall dress!! I really love the simplicity of the mod mini dress and the shirt dress is so gorgeous! I love love the professional dress. I could walk the city, go to work, or just feel awesome in it. i love dresses for fall too! there is something about a pair of tights and boots that give a dress a whole new look! oh how i love that gray sweater dress! I love fall dresses! I think I like the last one best! These are all so cute! I think I like 1, 5 and 6 the best...and now that I look at the prices, I see that I have expensive taste, haha! Oh I 100% love all these dresses! I wish I weren't so poor at the moment. I'm dying for some new fall clothes! I love #1. I am always so jealous of everyone blogging about fall. I think we pretty much skip that season down here in Florida which is unfortunate since it is my favorite. Aww, fall dresses are the best! These are great selections! I LOVE number 6... of course that's the priciest one, hehe. But I'm also in love with everything Shabby Apply makes- my dream wardrobe!